Network X: It has been a while since we last spoke with you. What have you been up to? Jay Weidner: I have been very busy since we last spoke together. My wife Sharron Rose (author of the book, The Path of the Priestess) and I have started our own esoteric video production and distribution company called Sacred Mysteries. We also have a web site at www.sacredmysteries.com, which has received over two million hits since it first came out in October 2003. I have made documentary films on people such as the Visionary Artist Alex Grey and Shaman/Healer Alberto Villoldo. I have co-written two books (both with Vincent Bridges). The first one came out in 1999 and is called, A Monument to the End of Time: Alchemy, Fulcanelli and the Great Cross. This year the second book was released by Inner Traditions and is basically the same book with new research. It is now called, The Mysteries of the Great Cross at Hendaye: Alchemy and the End of Time. Network X: Are these books about your investigation into the work of the enigmatic alchemist Fulcanelli? Jay Weidner: Yes, as we have discussed in previous interviews, I have been looking into the Fulcanelli phenomenon for almost 18 years. It started in 1986 when I found the book, The Mystery of the Cathedrals by Fulcanelli at a garage sale in North Hollywood. This minor event began the most important journey of my life. When I first read the book I was amazed by its intelligence, its articulation and its obscurity. I wondered about its anonymous author named Fulcanelli. I was dumbfounded by it and I have continued to reread the book throughout the ensuing years. I still read it every six months or so. Once I found it, the book sat by my bedside for the next five years, its pages slowly curling up from constant use. I became determined in 1991 to uncover all of it’s secrets including the odd chapter at the end called ‘The Cyclic Cross at Hendaye’. 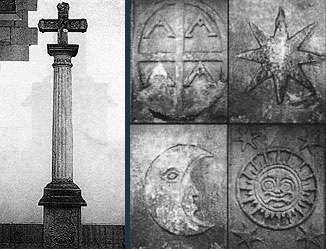 In this chapter Fulcanelli speaks of a strange cross in a churchyard in the small southwestern coastal town of Hendaye France, built by a mysterious and unknown alchemist over 350 years ago, and that it holds the secrets of the universe. Now that was intriguing to me! By then I had moved from L.A. to Seattle and was a virtual occupant of the Seattle Metaphysical Library where I spent the next four years attempting to uncover the truth about Fulcanelli, the anonymous author of The Mystery of the Cathedrals. I began reading the works of René Guenon, Julius Evola, R. A. Schwaller De Lubicz, Elphias Levi, Gershom Scholem, Robert Lawlor and any alchemical text or book on French Hermeticism that I could find. The library really helped me out a lot. Through this research I discovered that the chapter on Hendaye had not been in the original edition of The Mystery of the Cathedrals that was printed in 1926. It was apparently added to the edition that was reprinted in the late 1950’s. This bit of news alarmed me and made me focus on the additional chapter in Fulcanelli’s book on the Cross at Hendaye. It was at this time that I also discovered the essay by one Paul Mevryl concerning the Cross at Hendaye in the book The Fulcanelli Phenomenon by K. R. Johnson. Paul Mevryl’s essay is really a strange mix of disinformation and real facts all thrown together in a science fiction stew that had cooked too long. Network X: What year was this? Jay Weidner: This would now be late 1991. Soon I was to be the host and producer of the radio show Mind Over Matters at KCMU in Seattle. This would interrupt my investigation in some ways and help it in others. Especially later when it came time to actually seek funding for the research. But then, in 1991 and 1992, I didn’t have enough data yet to get anyone interested. The few souls who bothered to listen to my discoveries didn’t think it was enough to get concerned about. I persevered though. My family and friends thought that I had lost my mind. I became obsessed by all of the secrets that the world was hiding, the occult, French Hermeticism but most especially alchemy. So the show Mind Over Matters became a vehicle for the outer fringes of the research that actually began with my investigation into Fulcanelli. I knew that the Cross at Hendaye was telling me that a catastrophe of some kind was going to happen. Fulcanelli clearly tells us that this catastrophe will not only herald the end of the Iron Age but will also be of a celestial nature. Indeed the angry sun face on the Cross indicates that this disaster has something to do with the sun. But I was lost. I had figured out that the bottom pedestal part represented the solar system from our earth’s point of view and that the cross on the column above the pedestal was representing something beyond the borders of our solar system. The questions of how an unknown alchemist working on the cross 350 years ago could know about all of this also amazed me. Now I also knew that there was another world, of sorts, that lay at right angles to our world. Through all of this research I was beginning to understand the hyper-dimensional nature of our reality. One of my good friends was, and still is, Dr. Juris Kalnins who worked at the UC Berkeley Particle Accelerator in the Bay Area. Through his incredible knowledge I began to understand the dynamics of the hyper dimensional matrix that surrounds us like an invisible veil. Also through my radio show I met many scientists and mystics who were attempting to explain the relationship between these multiple dimensions. I had discussions with Michael Talbot, Stan Tenen, Richard Hoagland, Terence McKenna and many more. It was Terence who first clued me in that the center of the galaxy might be important to the Hendaye work. In 1994, I had a long conversation with him in Seattle concerning alchemy, Fulcanelli and the Cross. Although he was more interested in John Dee, he did point me in the direction of looking at the center of the galaxy in that conversation. Network X: Wasn’t he was on your show many times during that time period? Jay Weidner: Yes, he was a favorite of the listeners and mine. Even though I knew all of these things about alchemy and the Cross at Hendaye I still didn’t have enough information to get anyone really interested in helping me financially. I had decided to devote my life to the quest of understanding the Fulcanelli/Hendaye puzzle and was frankly looking for help. I wrote out the inscription on a piece of paper and carried it with me all of the time. I also carried with me a copy of Fulcanelli’s description of the Latin inscription. One can read about this in my 2 books but needless to say I had decided to break the code of the inscription. For many months I lay the paper with inscription out in front of me and would just stare at it. I found out a lot of other ways to reword and rephrase the inscription. Some made more sense than others. This process is all laid out in the books. One day though, while waiting in my car for someone, I laid out the page on the seat and I let my eyes go out of focus as I looked at the words. I remembered Fulcanelli’s description that the phrase is describing a place of refuge ‘and we learn that a county exists, where death cannot reach man at the terrible time of the double cataclysm’. Not knowing what ‘Urcos’ meant I looked it up the words in an Atlas and found that 20 miles away from Cusco was a town called Urcos. Now I was blown away. Besides beginning to read everything I could on the history of Peru I now had something that would allow me to show that the research had actually accomplished something. I placed my breakdown of the Latin inscription out on some large pieces of cardboard to use for demonstrations and began looking for some help in the investigation. But before I go on with my story, I must tell you that one of the very first things I discovered when I looked into the history of Peru was the 16th century book, Chronicle of Felipe Guamen Poma de Ayala. In the book I discovered the drawing by Ayala, which shows the symbols of the cross at Hendaye in ancient Peru. The evidence was now building that the Cross at Hendaye and the writings of Fulcanelli were anything but unimportant. With renewed interest I plunged into The Mystery of the Cathedrals again looking for more secrets. Network X: Did you ever get any funding? Jay Weidner: I could see that people were now excited by the research. I showed some of my friends at the Seattle Metaphysical Library what I had and they encouraged me to keep going. A wealthy woman on Bainbridge Island gave me money also to continue the research. By early 1996, I had revealed the research up to that point to a wealthy friend of mine named Gerald Kessler. He was impressed with it and agreed to help finance trips to Peru, Egypt and France. I have to say that 1996 was the threshold year for the research. Almost everything of importance, outside of the Peru Interpretation, occurred in 1996. In March 1996, I had shown my work to the wealthy Colorado businessman Jirka Rysavy. Besides being a brilliant businessman, he was one of the few people that I have ever known that really understands hyper-dimensional physics. Jirka told me at that time that he was going to use his wealth to fund researchers, like me, who were looking into the subjects of alchemy and higher dimensional physics. He had already given a lot of money to Stan Tenen and Richard Hoagland and he wanted to help me as well. In June of 1996, I moved from Seattle to Boulder Colorado to ostensibly work for Jirka. He wanted me to build an esoteric library for him that would be second to none, and I was to host and produce the two ‘Awakening Gaia’ conferences. In return, Jirka would finance my trips and pay me to do the research. One of the people that Jirka also funded at this time was Dan Winter. Dan moved to Boulder in August 1996. He is an interesting guy and I had many long conversations with him concerning magic, physics and the Hermetic tradition. Dan desperately wanted to know about my Hendaye research but like a good hermeticist, I was keeping quiet about it. Jirka would fund me but I had to be discrete, that was our bargain. At this point everything broke loose. Dan introduced me to a guy named Nick Fiorenza. Nick had just written an article called, ‘Erection of the Holy Cross.’ Nick was a good guy and he wanted me to read it. When I did I knew that the next major answer to the puzzle of Hendaye was solved. Nick had taken up where several other astrologers had started. 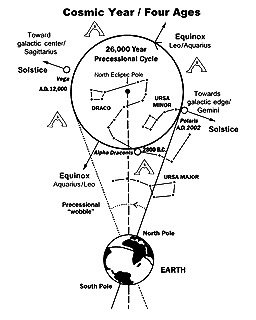 What Nick and these other astrologers realized was that, soon, the center of the galaxy was going to be at a direct right angle to the Earth’s position in the precession of the equinoxes, essentially creating a ‘great cross’ in the sky. Exactly when this was going to happen was up for debate. Nick was saying sometime in 1999, others a little later. There was enough ‘slop’ in the measurements for a great deal of uncertainty. Furthermore, this ‘erection of the great cross’ only occurred every 13,000 years. In a flash I knew I had it. The four ‘A’s’ on the pedestal of the Cross at Hendaye represented the 26,000 year long precession with each age being of approximately 6,500 years length. Every 13,000 years the ‘great cross’ would occur. This lined up perfectly with Fulcanelli and eerily shadowed what Mevryl had also said. Now I had at least a rough time period for the great end of this age, the Iron Age. But it wasn’t exact. I asked Nick to check out the exact moment that the Great Cross would occur on his Voyager Program but for some reason, Nick was unsure and would not give me a date. I presented this data to Jirka and he was amazed. In October of 1996, I hosted the first of the two ‘Awakening Gaia’ Conferences. They were wonderful. I was like a kid at Christmas. I got to pick anyone I wanted to attend the conference and Jirka would pay him, or her, to come to Boulder. Graham Hancock, Robert Lawlor, Robert Bauval, Gregg Braden, Robert Temple and many others came. We had a great time and over several days I was able to talk with each of them about the Hendaye material. Of all of them the one that showed the most interest was Robert Lawlor. He agreed that the Cross was pointing at the center of the galaxy and that the end of the Iron Age is likely upon us. As a writer of books on Sacred Geometry and the Aborigines of Australia as well as being the translator of much of the work of Schwaller De Lubicz, including the massive Temple of Man volumes, I was a willing listener. Robert suggested that I read the work of Astro-Physicist Dr. Paul LaViollete. Lawlor remembered that LaViolette had some good theories concerning a disaster from the center of the galaxy. As 1996 came to an end I was satisfied that the work was going as desired. My discoveries had been momentous and I was really very happy. Perhaps the happiest I have ever been. In February 1997, my wife Sharron Rose and I went to France. Using Fulcanelli as our guide we visited Hendaye, photographed and measured the Cross at Hendaye (I was thankful that it really did exist! ), we visited Notre Dame and the Black Madonna’s of Toulouse, Le Puy and Chartres Cathedral plus many other incredible and fascinating sites. At that time I had decided that I finally had enough material to write a book about the Cross at Hendaye, Fulcanelli and my surreal experiences. But first Jirka wanted me to host the second ‘Awakening Gaia’ Conference, this one to be held in Boulder in May 1997. This time we would have other new guests such as Joscelyn Godwin, John Anthony West, Paul Devereaux and many others. In the meantime I had read Paul LaViolette’s book, Beyond the Big Bang. I could see why Robert Lawlor was a big supporter of LaViolette and his works. Showing the book to Jirka he became excited also and asked me to invite Dr. LaViolette to the conference. What happened when Dr. LaViolette gave his lecture at the second ‘Awakening Gaia’ conference in May 1997 was the final link in the chain of evidence that I had been building slowly. While I had asked Paul to talk about his theories from his book, Beyond the Big Bang, he wanted, instead, to lecture about his new book, Earth Under Fire. I relented to this even though I had never seen his new book. Over the course of the next two and a half hour lecture Dr. LaViolette answered many of the last problems posed by the mystery of the Cross at Hendaye. Using empirical scientific evidence Dr. LaViollete revealed that there was a periodic explosion from the center of the galaxy depositing iridium on the surface of our planet. Showing us ice samples taken from Greenland, he revealed how these iridium deposits fall in 26,000-year layers suggesting that the pulse from the center of the galaxy is somehow linked to the precession of the equinoxes. He showed how the stinger of the constellation Scorpio and the arrow of the constellation Sagittarius were pointing at the center of the galaxy. He unveiled the fact that the vast amount of iridium coming from the explosion of the center of the galaxy would eventually coat the surface of the sun and cause it to explode like a T-Tauri Star. This fact not only explained Fulcanelli’s enigmatic phrase ‘double cataclysm’ but also explained the angry sun face on the pedestal. I was limp by the time the lecture ended. Jirka and I sprang out of our seats running up to LaViolette asking him questions about alchemy and Fulcanelli. But LaViolette knew little about alchemy and nothing about Fulcanelli. I now knew that the star on the pedestal of the Cross, which sits behind the sun, was the symbol for the explosion from the center of the galaxy. I also knew that the center of the galaxy is the dark sun of the occult, the dark goddess of mythology and was probably the basis for the myth of Isis, who bore our sun as her son. The mythologies of Egypt, India and Tibet began to make more sense to me also as I placed them in the context of four ages, the precession of the equinoxes and the disaster from the center of the galaxy. Jirka became so excited about LaViolette’s lecture and the information conveyed that he immediately paid Dr. LaViolette a sum of money and told me to begin writing a documentary based on LaViolette’s book ‘Earth Under Fire’. I would Produce and Direct the film and we would make it available to the world so that everyone would know about this incredible information. Excited, I retired to my mountain house and spent the summer of 1997 writing and rewriting the screenplay for Earth Under Fire. By June of 1997 I also had met Kevin Townley, another resident of Boulder who was, believe it or not, translating Fulcanelli’s second book, The Dwellings of the Philosophers into English for the first time. Also surprised by this synchronicity, he agreed to let me read the translations as they were being done. So now I would be one of the first people in the world who had the opportunity to read Fulcanelli’s second book in it’s English translation. Kevin also gave me a very special gift that day which was a book called, The Cube of Space by Paul Foster Case. Overjoyed at the prospect of soon being able to read Fulcanelli’s second book in English I went home and read Case’s book. It was then that I discovered that the pedestal of the Cross at Hendaye was really a representation of the Cube of Space. The vertical column was the symbolic representation of the space between our solar system and the center of the galaxy, which was represented by the cross on the top of the monument at Hendaye. The inscription on the Cross told the seeker where to go at the time of the ‘Great Cross’. This place would be a refuge against the onslaught of a celestial disaster perhaps the one that LaViolette had discovered in his research. When the Cube of Space lines up, the ‘disaster’ or the ‘great change’ occurs. The erection of the Great Cross was also the erection of the Cube of Space. Knowing my multidimensional physics I realized what this meant. The angles of the inner cube were lining up with the angles of the greater cube. This meant that a significant moment in the sacred geometry of our solar system and the relationship to the center of the galaxy was about to occur. In August of 1997, Jirka flew me to Santa Fe to talk to William Sullivan, the author of the recently released book, Secret of the Incas. Jirka agreed with me that Sullivan might be able to assist the investigation as least as far as the Peru material was concerned. In another one of the weird synchronicities that runs through the course of this research, I also met Dr. Juan del Prado who was traveling with William Sullivan. Dr. Del Prado is an archeologist at the University of Cusco. Over a glass of wine, we talked about the long and sordid history of Peru. Finally near the end of the evening, I asked him about the town of Urcos and if there was possibly a cross located there. Del Prado looked at me with a puzzled expression. “Yes there is a cross in Urcos. No one knows who built it or why. But it has been there for centuries.” One more time the Cross at Hendaye was proven correct. I was getting ready to shoot Earth Under Fire with Dr. Paul LaViolette in October 1997 when Vincent Bridges and his wife Darlene showed up in Boulder for a visit. Vincent and Darlene were old friends of Dan Winter. Sharron and I had met Vincent originally in Boulder in September 1996 where we had a conversation in which he told us that, besides graduating from the University of North Carolina with a Graduate Degree in History, he had also been a journalist for years, having written for many nationally known magazines like Rolling Stone, Whole Earth Review, Newsweek, Crawdaddy and many others. He said that he had also written a novel Walspurgisnacht, published by DAW Books and that he now owned a publishing company called Aeytheria Books which was a LLC out of his native North Carolina. Impressed by these credentials, we invited Vincent Bridges and his wife Darlene to stay at our house high up in the Rocky Mountains in late October 1997. He was extremely well versed on many arcane subjects. So the first few nights were spent in a rambling conversation on a plethora of subjects ranging from psychedelics, to politics, to his experiences with the occult. Vincent had no idea what I was working on but I could see that he was extremely curious. His friend Dan Winter had been trying for months to discover what Jirka and I were doing so it was no surprise that Vincent was also curious. A couple of days after his arrival I began realizing that I needed to show my work on Fulcanelli and the Cross at Hendaye to someone who had a background, not only in orthodox history but also unorthodox history. And I felt that Vincent, with his impressive credentials, might just be the guy. As a winter storm swept over us, we sat by the warm fire in my living room and I showed Vincent and Darlene all of my Hendaye and Fulcanelli material. Vincent was overwhelmed and excited. Then using an obscure quote that he had discovered earlier from a Golden Dawn transcript and his Voyager Program, we settled on the date of September 22nd 2002 almost five years in the future as the ‘climax of history’ according to the Cross at Hendaye and Fulcanelli. This was, perhaps, Vincent’s most significant addition to the Hendaye research. In February 1998, Sharron and I finally went to Peru in search of Inca Caves and the Cross at Urcos. We found both, as well as what later would turn out to be the ruins of Atlantis at Tiahuanaco. In the end, the Cross at Hendaye leads the seeker to the ruins of Atlantis which occurred at the end of the Second Age, 13,000 years ago. The final parts of the puzzle fell into place in 1998. I received an advanced copy of Maya Cosmogenesis 2012 by John Major Jenkins in which he reveals that the great Mayan calendar would end with the helical rising of the center of the galaxy on the winter solstice in 2012. Furthermore, Terence McKenna, who had earlier told me to examine the center of the galaxy in my Hendaye research, wrote the Forward to his book! To pile synchronicity upon coincidence I then found out, through my good friend Laura Lee in Seattle, that John Major Jenkins was a neighbor of mine in Colorado. Getting his home number from her I called John thus beginning a long and fruitful friendship. It seemed to me by the end of 1998 that the Cross at Hendaye was actually describing a ‘season of the apocalypse’ rather than a specific date. The two X’s on the cross, coupled with the number 20 card from the tarot appeared to indicate a twenty year, or so, final cycle of this season, with the September 22nd 2002 date at the very center of this twenty year span, which would end ten years later with the helical rising of the center of the galaxy in 2012. In the end, I must be judged by what I reported. While no apparent apocalypse occurred on September 22nd 2002 the world has been altered almost beyond recognition since the first book came out in 1999. The 911 disaster happened one year and eleven days before the Hendaye target date and George Bush waited until the equinox just following the Hendaye date to start the war in Iraq, a war that could very well lead us all to Armageddon. On top of that, Fulcanelli assures us that the northern hemisphere will soon be ‘tried by fire’ and sure enough, the summer just following the September 22nd 2002 date was the hottest in 500 years in the northern hemisphere. Ultimately the hottest of eleven summers of record heat in a row going back to the beginning of the final 20 year cycle that started, according to the Cross, in 1992. Network X: So is the world ending? Jay Weidner: I don’t know. I made a film recently with Dr. Alberto Villoldo called Healing the Luminous Body: The Way of the Shaman. In this film Villoldo tells us that the Incan shaman believe that 2012 heralds what they call a pachacuti or period of upheaval and renewal that occurs at the end of time in which the world will be turned right side up again. He tells us, “There will be a tear in the fabric of time itself, a window into the future through which a new human species will emerge. They call this new species, Homo Luminous“. I don’t know if this is what is really happening but if the pursuit of alchemy is to turn lead into gold, so perhaps, the real goal of time and history is to turn the lead of the human body into the gold of Homo Luminous. Perhaps, like the ancient Egyptians believed, we will become stars in the heavens being born in the Bardo dreams of Orion. To be honest though, I don’t really know. Network X: What are you doing now? Jay Weidner: I’m working on a motion picture project with my step-son Ari, I am writing a novel, and with my wife Sharron Rose, I am writing a book on the alchemical symbolism in Tolkien’s The Lord of the Rings. Our company Sacred Mysteries has several exciting new videos for release in 2004, and we are beginning a school devoted to the principles of Hermeticism and alchemy. My life is full right now. In fact, I could really use a vacation. Network X: Thank you for your time.